Are there more pollutants in the water today than there were 25 years ago? Do we have less water today than we did 100 years ago? Below are some of the common myths you may have heard about drinking water, along with an explanation of the reality. Myth: We have less water today than we did 100 years ago. Reality: There is the same amount of water on Earth today as there was when the Earth was formed. The difference is that today, many more demands are placed on water. These increased demands have created a different kind of water today, one that is regulated, treated, and sold. Tip: Because demands on water continue to grow, but our supplies don't, lend a hand to conserve, protect, and get involved with decisions that affect our water resources. Myth: Once you use water, it is gone. Reality: After water is used, it is recycled innumerable times. Some water is recycled quickly and will be used again within a week. Other water may not be used again for several years. Tip: To help reduce your impact on our water resources, look for ways to reduce your water consumption. Myth: If there is lead in your water, it's the fault of the water treatment plant. Reality: The most common source of lead in drinking water is the plumbing in your home. Your plumbing may have lead pipes or lead solder in the connections. Lead is a contaminant that is particularly harmful to pregnant women and young children. If you are concerned about lead in your water, contact your local public health department or water utility to find out how you can have your water tested by a certified laboratory. If the test reveals that the lead content of your water is above 15 parts per billion, you should take action to reduce your exposure to it. Tip: Because water standing in pipes tends to absorb lead, flush the pipes before drinking by letting your tap run until the water is cold. Myth: There are more pollutants in drinking water today than there were 25 years ago. Reality: Not necessarily. Twenty-five years ago, we did not have the technology available to determine what was in our drinking water. Today, we have sophisticated testing instruments that enable us to know more about our water than ever before. Myth: Using a home water treatment device will make tap water safer or healthier to drink. Reality: Many of the water treatment devices on the market today can help improve the taste, odor, or color of the water. In addition, some of these products can actually reduce our exposure to harmful contaminants such as lead, parasites (Cryptosporidium), and trihalomethanes (chlorination by-products). Tip: Make sure your water treatment devices are independently tested by an organization such as NSF International and that the device is certified to reduce those contaminants which are of special concern to you. 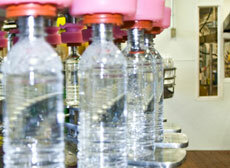 Myth: Bottled water is always safer than tap water. Reality: Not necessarily. Bottled water is regulated by the Food and Drug Administration (FDA), which has established water quality requirements similar to those established by the EPA for public water supplies. Bottled water products and public water supplies are not required by either agency to be 100% free of contaminants. However, the end product should always meet all federal, state, or provincial drinking water standards. Tip: To learn more about your local water quality, contact your municipal water supply and request a free copy of their annual water quality report. You can also contact your favorite bottled water company to see if they have a similar report available. These reports should identify the contaminants present and the amounts detected, if any. Myth: Water will purify itself, so we don't need to worry about it. Reality: We cannot take the quality of our drinking water for granted. Every pollutant we put into the environment potentially can make its way to our drinking water supplies. It is important that we protect our water resources from contamination and ensure that our public utilities and private well owners have adequate resources to be able to provide safe drinking water supplies.